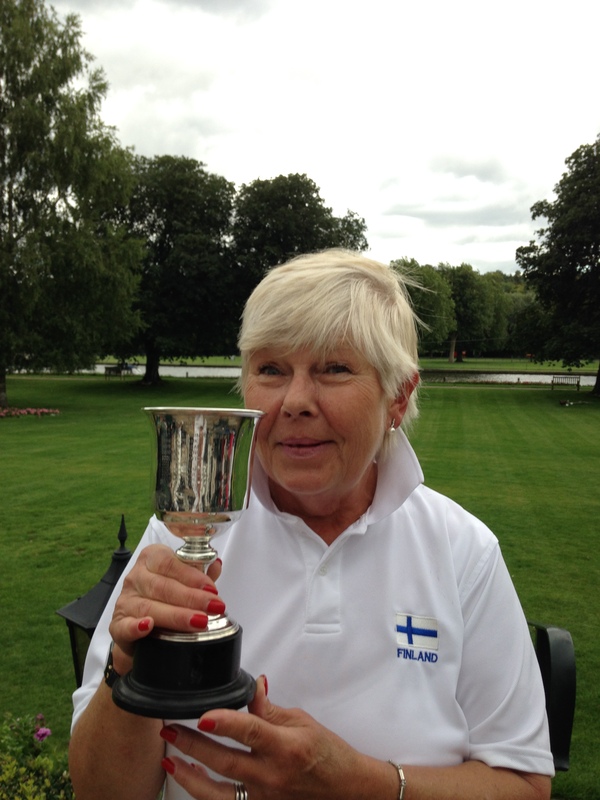 Helena Fensome won the Ladies Open Singles and lifted the fabulous silver cup donated by Rosie Richardson for the first time today. It was most pleasing to have our Club's top five ranked ladies taking part this year and this gave the tournament the gravitas that it deserved. she was especially disappointed to be absent. The block games went pretty well with seeding, with the top four progressing to the semi-finals. her opponent's ball through hoop 4.
of Gaynor's nearly jawsed ball at the 13th to save a real 'scalping'. Fensone got her act together in her semi and ran her hoops with confidence from all over the place to beat Jackson fairly comfortably. In the other semi, Colman took the first hoop and then traded those that followed, until a crucial missed clearance at 11 switched the score and Mead won 7-6. In a curtain-raiser to the final, Gaynor and Nina Cox had a 'penalty shoot-out' for the Plate Final (5th place), and Gaynor's 2-1 win earned her a bottle of wine from Rosie. So the final was a re-match of the Fensome v Mead block game, and this time it was the latter who managed to repeat almost identically, the accidental peeling of her opponent at hoop 4. With a two hoop lead established, Fensome never looked back and wrapped up the game 7-4 top take the 2015 Ladies title. Rosie duly presented Fensome with the cup and champagne and then treated everyone to more bubbly and afternoon tea which really was most generous. Our AC A-Level team went down 0-2 at Blewbury who fielded England International Robin Brown (-1.5) and Nick Butler (-1). For PCC, Carole Jackson (0) and David Hopkins (2.5) were rather out-gunned and lost -11 TPO and -23 repectivly. PCC 'C' won the last three games to finish today to secure what could be a valuable 6-6 draw as they defend their league title. High Wycombe got the better of the first two rounds of doubles games, meaning that PCC 'C' had it all to do in the two rounds of singles that followed. Captain John Chalfont was today's hero in winning both his singles which brought the balance of the match back level. Most satisfying was his defeat of fellow PCC member Richard Peperell, who plays his league croquet for High Wycombe and is two handicap grades lower than John. This draw sees PCC 'C' still commanding top spot in their league with one fixture to go. Our other handicap team PCC 'B' can do the 'C' a big favour by taking a point or two off of Wingrave on Monday which will take them out of the league title running. If that happens and the 'C' can win their last match against Blewbury on 24 August, the Northern Division League title will be theirs, and a final play-off against the Southern Division winners will beckon. There was cause for celebration for a second day in a row today when PCC won through to a National Inter-Club Shield Final for the first ever time! Our 'Murphy Shield' team had a tougher time that the eventual 6 -1 scoerline suggests against our friends from Hamptworth, as deciding third games and several 7-6 results had to be endured. PCC held a 2 - 1 advantage at lunch thanks to top pair Frances Colman and Roger Goldring's doubles victory (in which they out thought their opponents well) and Raymond Wood's singles win, both in straight games. This meant that two wins in the four afternoon singles rubbers would be enough to secure the fixture win. Colman was first to finish but had had to come from behind in both her games to win. She peeled the experienced handicap 2 Vic Stillwell through two hoops in the first game but got back to 7-6 thanks to clever patient tactics. Ahead and seemingly cruising in the second, she peeled him again from an apparently impossible angled hoop 11; so that game necessitated another tussle at hoop 13, before Colman prevailed. With Goldring and our fourth team member Mary Gaynor's matches going to a third game, all eyes turned to Wood's last few hoops as he closed in on a two game victory. Again patience was shown and it paid off when he wrapped up his win at hoop 11 and so with it the fixture was decided and PCC were IN THE FINAL! Mary Gaynor finished her match victorious moments later, and after a short while Goldring made it an afternoon clean sweep for PCC. Most pleasing was the tactical display by our team, who for the most part displayed great restraint in their play and resisted the temptation of the 'hero shot' in favour of patient tactics, and this was the key to their very deserved success. This is a great achievement for our Club and one of which all club members can be proud. The Murphy Shield is the Croquet Association's second tier Inter-Club knock-out competition (teams may field one handicap 2 player and the sum of the four players' handicaps must be 12 or more). PCC will now face Nottingham in the National Final at a neutral ground (yet to be arranged), sometime in September. PCC 'Murphy Shield' - Frances Colman, Roger Goldring, Raymond Wood, Mary Gaynor. 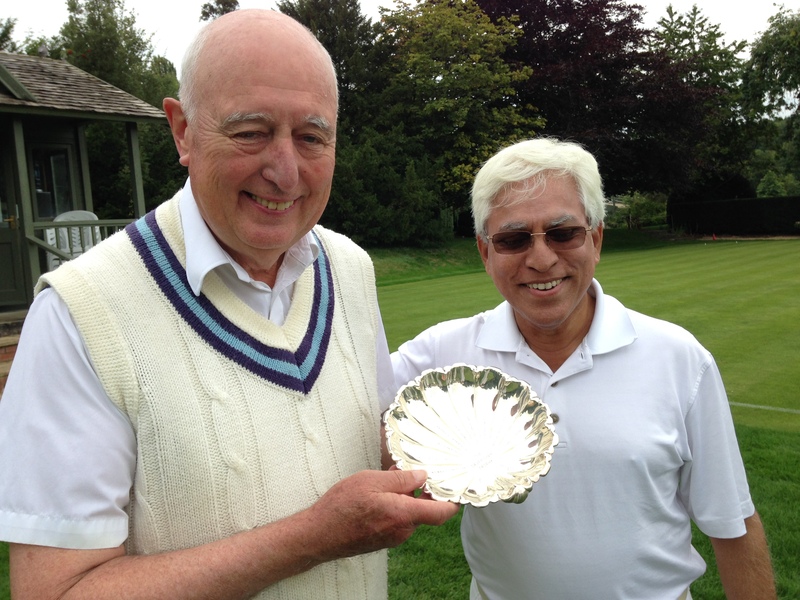 (Also played for PCC 'Murphy Shield' this season - Mike Fensome and Don Rutherford). 10 August - PCC 'A' (GC) win the SCF's top Level League for the first time! A convincing defeat of visitors Littleton secured a first ever Southern Federation Level League title for PCC 'A' today. They won 6 - 1 against game opponents who clearly raised their game on their first visit to Phyllis Court. Earlier victories over Winchester and last week Ryde, our two main rivals in the league in recent years, were the keys to this first title win. PCC scored an unexpected draw with Blewbury's 'minus' players this evening. Chris Roberts took bar far the biggest 'scalp' of his career when he beat England International Robin Brown in a game that ended in near darkness. David Hopkins came in for Carole Jackson to play Nick Butler but found the experienced Blewbury man too good for him again. The reamining two games in the four-game league match with High Wycombe were won today by Harry Midgley and Rahu Iyer. 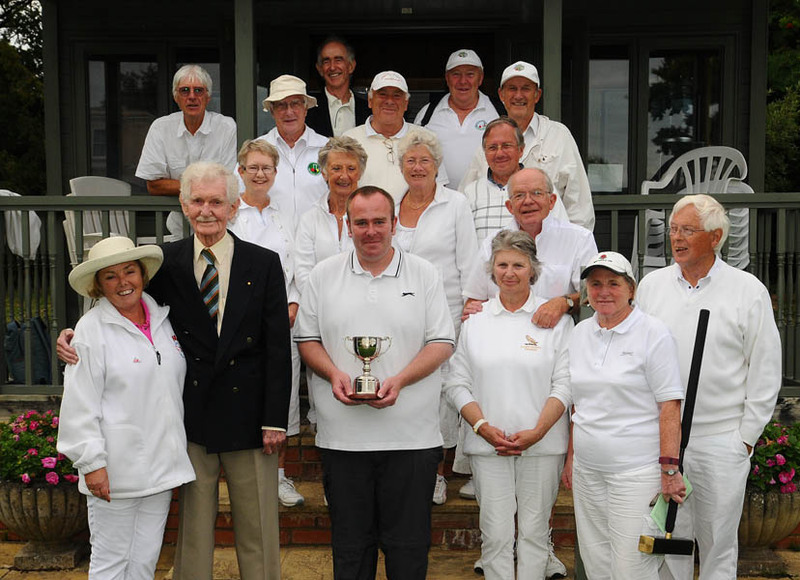 Brian Bucknall and Elizabeth O'Dair had won their games much earlier on, and so a 4 - 0 was recorded and earned PCC second place in the SCF handicap League (North) behind winners Oxford University. This year it was our tour to visit the splendid All England Club, Wimbledon, and once again our players were treated royally. Either side of a splendid lunch and visit to the Tennis Club's Royal Box, our team were rather out gunned by our hosts. Chris Roberts and Harry Midgley didn't really get a look in in the AC singles but faired little better in the afternoon doubles match. On the GC court, Frances Colman, Ralph Chambers and Dilys and Alex Earnshaw, came back well after being well behind at lunch, to draw the afternoon session. The difficult season for PCC 'B' (GC) continued today with another league loss. are doing well, the lower handicapped players in the 'B' team, are suffering and ending up on the receiving end. Our other three competitors Ian and Delai Norris, and Dianne Brown, faired less well. This annual event was held over the past two days and attracted 16 players from eight different clubs, including three of our own members. competitor by a number of years. The Phyllis Court players participating were Delia Norris, Richard Peperell and Don Rutherford, who each won five games and came joint 10th. It was lovely to welcome back Smokey Eades to present his trophy once more. Top seeds Carole Jackson and David Hopkins survived an early scare to win their first Phyllis Court trophy today. However the day was not without a couple of surprises and chief of these was the performance of Brian Bucknall and Nina Cox, who despite low seeding, won through to final. But first up it was the block games where Bucknall and Cox first showed their form with a wins over higher ranked opponents Goldring & Chalfont, and Rutherford & Gaynor. Jackson and Hopkins survived a 13th hoop scare in their last game to win their block undefeated and qualified for the semis with Bucknall and Cox coming through in second place. The other block went with seeding with the deciding match turning when Chris Roberts (partnering Frances Colman) peeled Pam Mead through hoop 12 and so conceded first shot advantage to the 13th to Mead and Helena Fensome. The latter pair took the hoop and so won the block with Roberts and Colman as runners-up. In the 19 point semi finals, Jackson and Hopkins controlled their match with Roberts and Colman from the very start and won easily, whilst the other semi was a nailbiter. Surprise package Bucknall and Cox got ahead by two or three hoops but despite seeing their lead whittled away by Fensome and Mead, they survived to score a last hoop victory. held over the past two days. of untimed games by manager Raghu Iyer gave proceedings a true tournament feel. having represented PCC 'A' in league matches this season. Manager Iyer (handicap 18) had a very good tournament and, like Midgley, he won all his block games to reach the final. good number of Iyer's extra turns for little gain to the latter. Frances Colman who rewarded him with an handicap cut from 18 to 14. In the novice event, Helena Fensome (handicap 20) and Hugh Crook (handicap 24) played a 'best of three' 14 point match between themselves on court 3 on Friday alongside the senior event. SCF Handicap League North Division to their opponents Blewbury. of singles, meaning the 'C' had to win all of the last four singles rubbers to save the day. And tthis they did! at the League Final against the Southern winners Bransgore, at Winchester on September 15. PCC 'C': John Chalfont, Delia Norris, Colin Morgan, Dianne Browne. (Also played for PCC 'C' this season - Hugh Crook). Mr & Mrs Norris certainly are a formidable partnership at GC, and they proved it again o the manicured courts of the Hurlingham Club today. They puuled off a fine victory and when fuller details are known they will be reported here.